Alexander George Thomson first practiced as an architect and civil and mechanical engineer from an office at 140 Buchanan Street, and formed the short lived partnership, Black & Thomson, with Robert Black in 1854, at 16 Moore Place. From 1856, Thomson practiced on his own at various addresses in the city, and was elected a member of the Institute of Architects in 1869. Few of his buildings have survived or been identified and he is best known for his campaign to save the High Street frontage of the 17th Century Old College from destruction in the 1880s. With the financial support of the shipbuilder Sir William Pearce, he successfully arranged for the structure to be dismantled and moved to University Avenue and rebuilt to his own design as the Pierce Lodge (1886). 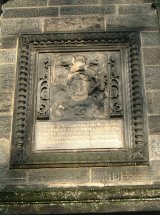 In saving the facade he became responsible for rescuing much of the Old College's ornamental carvings, including its magnificent coat of arms of King Charles II, of 1658, the arms of the University, of 1632, and a number of human masks and Latin inscription panels, which, as a whole, comprise one of the finest surviving collections of 17th Century architectural sculpture in Scotland. 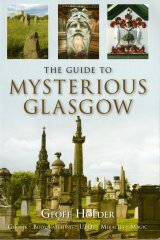 A less well-known example of Thomson�s work is the Inglis Monument in the Necropolis, a huge Gothic monument to the family of the engineer and shipbuilder, John Inglis, which was constructed in white granite (1883). Alexander George Thomson is often confused with Alexander �Greek� Thomson, whom he was neither related to or influenced by. A G Thomson�s final appearance in the Post Office Directories was in 1899, when he practiced from 109 Hope Street, and lived at 1 North Claremont Street. After his death, a memorial window was installed in All Saints Church, Woodend Drive, Jordanhill, which depicts him as �The Architect Inspired�, seated at his desk with an image of the Old College gateway in the distance.